Proliferating demand for high octane gasoline across the globe is a key driving factor for the C5 – C8 normal paraffin market. As C5 – C6 normal paraffin is commonly consumed for the production of iso-C5/C6 compound that further combined with the gasoline in order to enhance an octane number of gasoline. Similarly, with growth of automotive industry as well as growing gasoline-powered vehicle parc in developing region that in turn is expected to result in increasing demand for high octane gasoline, further driving the growth of C5 – C8 normal paraffin market over the forecast period. Moreover, recovery of oil and gas industry coupled with growing refining capacity provides impetus for market growth. Moreover, C5 – C8 n-paraffin fractions are further separated and processed to form several chemical products such as n-pentane, n-hexane and n-heptane, among other chemical compounds. Generally, n-paraffin are used as special-purpose solvents in multiple industries such as cleaning, adhesives and sealants and pharmaceutical, among others. Thereby, growing demand for C5 – C8 derivative compounds is anticipated to further accelerate the growth of market over the forecast period. C5 – C8 n-paraffin fractions are further processed and separated to form several chemical products such as n-pentane, n-hexane, and n-heptane, among several other chemical compounds. The demand for n-pentane for the production of polystyrene foam and pharmaceuticals is growing which in turn is fueling the growth of n-pentane in the market. Furthermore, the swelling demand for n-Hexane from end-use industries such as adhesive and sealant, agrochemical, and pharmaceutical, among others is anticipated to drive the demand for n-hexane and subsequently benefit the C5-C8 normal paraffin market over the course of the forecast period. N-Heptane is employed various synthesis and adhesive and sealant applications. Demand for adhesives and sealants is intensifying owing to the intensive progress in automobile production and surging demand from packaging materials, which is likely to fuel the growth of the n-heptane market and, in turn, positively impact the C5-C8 n-paraffin market. N-octane n-paraffin compounds are most commonly employed in the oil and gas industry for analyzing the octane number in automobile fuel as well as many other gasoline and petrochemical products. Additionally, rising demand for gasoline and petrochemical products is anticipated to stem from plastic, adhesive and sealant, pharmaceutical, chemical, and cosmetic industries, which in turn is expected to bolster the growth of the global C5 – C8 n-paraffin market in the coming years. 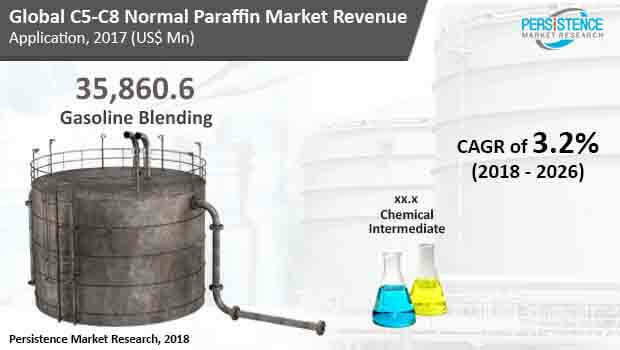 Increasing consolidation and expansion activities in the C5 – C8 normal paraffin market are posing significant impact on the market growth since the past few years. This can principally be attributed to the efforts being made by the market participants to meet growing demand for gasoline and gain access to the high-revenue markets in Asia Pacific. Key players are also focusing on strengthening their foothold in India, China, and ASEAN countries. In March 2017, ExxonMobil expanded its hydrocarbon fluids production capacity by 250,000 tons per year at its Antwerp, Singapore and Texas plants. Jilin Beihua Fine Chemical Co., Ltd.
Puyang Zhongwei Fine Chemical Co., Ltd.